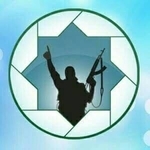 The Islamic Muthanna Movement (Arabic: Harakat al-Muthanna al-Islamiya) originated in 2012 as the Katibat Muthanna bin Haritha Qahir al-Fars (Muthanna bin Haritha the Conqueror of the Persians Battalion), founded in the southern Syrian province of Deraa by Aamer Ayyub al-Masalama, a former detainee in the notorious Saydnaya prison that housed many Islamists. The original leader was killed in March 2013 and replaced by his brother Abu Ayyub al-Masalama, and the battalion evolved into the Islamic Muthanna Movement. The group coordinated with a variety of actors and participated in a number of fronts, acting as a mediator between Liwa Shuhada al-Yarmouk and Jabhat al-Nusra in December 2014. However, concerns grew through late 2015 and the beginning of 2016 that the group was behind assassinations and disappearances of perceived rivals, which, combined with a statement in spring 2015 in which the movement appeared to show some sympathy for the Islamic State (while rejecting its Caliphate), sparked suspicions of links with Islamic State. The tensions culminated in open clashes with a number of rebels in January 2016. The group subsequently retreated westwards and established control over some towns, cooperating with Liwa Shuhada al-Yarmouk in an offensive against rebels in March 2016. However, the Islamic Muthanna Movement subsequently lost control of all strongholds and had to retreat into Liwa Shuhada al-Yarmouk territory, eventually merging under Jaysh Khalid ibn al-Waleed in May 2016 after the mysterious death of the Islamic Muthanna Movement's number two man, who had resisted the idea of a merger.